In 1976, “Candyman” David Klein came up with the idea of a gourmet jelly bean that featured a then-unique fruit flavored jelly interior. He approached the Goelitz Candy Company and together they created one of the finest manifestations of sugar in the history of the universe, Jelly Belly jellybeans. Considering that Jelly Bellys have figured prominently in my young Addict life (in my youth, they brightened many a dreary Cleveland Sunday and they literally accompanied me to every single one of my Intro to Philosophy classes in college), I was thrilled (and a little star struck) when recently granted the opportunity to ask 10 (or so) questions of their creator. CANDY ADDICT: Did you eat a lot of candy as a kid? What was your favorite? DAVID KLEIN: Lots and lots. I love candy. Always have. Always will. Mike and Ikes especially the red and orange ones… nothing better than eating one red and one orange at the same time. Chuckles candy… putting the red ones under hot water so that the outside sugar came off. The dark chocolate coconut bar from the Welch Candy Company. Chum Gum. 3 Musketeers frozen. Junior Mints. Sugar Babies. 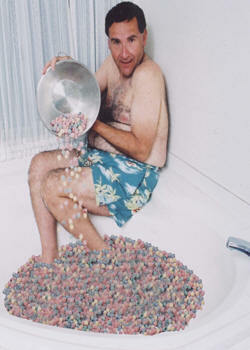 CA: I’ve read that creating the “Rolls Royce” of jelly beans was a childhood dream of yours. Is that true? Where did that dream/desire stem from? DK: No, not a life long dream. The idea came to me when I was talking to a buddy on the phone at about 8:15 on a Thursday night while watching “Happy Days.” We were talking about ideas for a new business. I said “What if we were to open a store which only sold jelly beans?” I was 29 years old at the time. CA: How did you come up with the unique idea for the flavored center of the Jelly Belly jelly beans? DK: I knew that to stand apart from the crowd the bean would have to be something very special. At that time it was a very novel idea to both flavor the inside center as well as the outside shell. Keep in mind that the beans retailed for $2.00 per pound back in 1976, when most other beans were selling for much much less. The customer needed a reason to spend so much money for the product. CA: Did you have any previous experience in the candy industry when you approached Goelitz Candy Company with your idea? DK: I was in the popcorn and caramel corn business with my uncle when I was 19 years old. I was a nut and candy distributor when I came up with the idea for the bean. DK: 100 percent hands on. The bean was a member of my family. It took on a life of its own. I once saw an episode of “Sanford and Son” and the name Lead Belly was mentioned… this stuck in my mind… Lead Belly… Jelly Belly. I picked the flavors. The logo was designed by a great artist, Kathy Fosselman. At the start there was not enough money to put the product in packages, so it was sold only in bulk to the stores. CA: Was Jelly Belly an immediate success? Has its success and widespread popularity surprised you at all? DK: For the first four months I could not give the product away. Even though the product was great, no buyers. The price at $2.00 per pound was the reason. The product did not get off the ground until [a] nationwide Associated Press article. I knew from the start that the product would be a winner. In fact, I had $800 to my name when I started Jelly Belly… I never lost faith in it. CA: When and why did you get out of the Jelly Belly business? DK: I sold the business in 1980 to the company that had been making the product for me… Herman Goelitz, as it was known at the time. The idea of selling the product to them did not generate from my mind… it was just one of those things that happens in business. Did I regret selling? Yes… but life goes on. CA: Were you excited when your daughter came up with the idea for Sandy Candy? What role did you play in its development? DK: From the age of 3, Roxy was always trying to come up with a new candy product. At a very early age she came up with the idea of pressed dextrose pieces of trains that would be like Lego toys… Chew Chew Chugs was her name for the product. When Roxy came up with the idea for Sandy Candy I was very excited and I knew that it would be a big hit. I did what I could to help her but 99 percent of the credit goes to Roxy. She is not only very very smart, but I have never seen anyone who works as hard as she does. CA: I hear you are going to be featured in an upcoming documentary. What can you tell us about that? Will it focus on the candy business? Your specific experiences in the candy industry? Your life now? None of the above? DK: For a period of three weeks I was followed around by a remarkable man, Costa Botes from New Zealand. The project will be feature-length and should be out in about 6 to 8 months. A clip from the documentary can be viewed on You Tube. The time I spent with Costa was very very exciting… [he] has over 45 hours on tape, [about] all of the above. I am looking forward to the release date and hope that [it] will be an inspiration for people who want to go into business. CA: What does the future hold for the Candyman and what would you like to see happen in the world of candy? DK: The Candyman is working on new products at this moment. The Gumdrop Kid is going to be brought back to life… gourmet gumdrops in flavors that have never been made before. The future looks very bright. I would love to help other candy makers in getting their new products off the ground. CA: What is your favorite Jelly Belly flavor? DK: Pear is my favorite. CA: Buttered Popcorn – love it or hate it? DK: Buttered Popcorn is not one of my favorites, but it sure does sell. CA: What do you think of the controversial Bertie Bott’s flavors and BeanBoozled? DK: What do I think of the vomit, etc. flavors? Not much. CA: Did you ever experiment with a bean with a different flavored jelly center and shell? DK: In 1978 we had a fudge line of the bean which had a chocolate center and a shell such as coconut, orange, mint, etc. They were quite good. CA: You’re trapped on a deserted island… what three candies would you make sure to have? DK: Three candies… caramel marshmallows made by my wife, Mike and Ikes, and Junior Mints. As I’m sure you can tell, David is a great and funny (not to mention brilliant) guy and my taste buds and I look forward to all his future contributions to the world of confections. That picture of him reminds me of Lloyd Kaufman. That is all I wanted to say. Great interview! Can’t wait to see the documentary. I consider Dave Klein a brother to me. You will never find a better person then Dave. He has been an inspiration to me. I was one of his first distributors with Sandy Candy. He has been trying to find a manufacturer for us for the carmel and licorice that we make. He has also helped so many people in the candy business. I don’t care where you are, just stop in any candy store that has been established for 20 years or more and mention his name. They will respond with “He’s the Man”. I’ve personally stopped in Candy distributors and they would say if it wasn’t for Dave I would not be here. He and his family are just the best!!! Post further info about your documentary on your blog, such as, premier time and location. It would be greatly appreciated. I was one of the winners in the Sandy Candy poetry contest, and Dave Klein called me last week! It was really quite exciting to speak with him. He was very entertaining and knowledgeable and kind. I mentioned that I particularly love sour candy and he threw in a bag of their new Sour Spanks with my prize package. Thanks Dave! It was a real thrill to speak with him. THANK YOU MONICA…..GREAT QUESTIONS……MANY OF THEM I HAVE NEVER BEEN ASKED BEFORE……….. I love the pic. that is hilarious. This blog rocks. I love it. As an elementary-grade teacher, I ordered a Jelly Belly video for my class. It came with a large pack of the Jelly Bellys (Bellies) and the children loved it. I showed it to many classes after that, and have used Jelly Bs in math classes and at year’s end, many students write that their fav classes were the ones with Jelly Belly themes…and they love the culmination – eating their favs. I bought a Jelly Belly dispenser and for rewards, the children could put pennies which I gave them …..into the machine for a reward of Jelly Bellies. Thank you David!